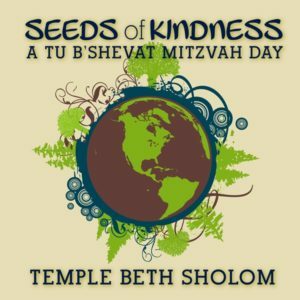 This year TBS is doing Mitzvah Day with a twist–an environmental focus. Our projects and programs are all focused on tending to and celebrating the earth. With this in mind, you will notice that many of our programs and projects are being held at the temple this year. Join us for a day of fun, friendship, and meaning for all ages. On Tu B’Shevat it’s a mitzvah to plant. Please consider underwriting our planting efforts by sponsoring a Seeds of Kindness plant for $18. We will be planting for our children, residents of Bubbe & Zayde, and Mitzvah Meals. In light of TBS Sacks the Plastic!, our advocacy program, participants may purchase reusable shopping bags with our beautiful Seeds of Kindness logo. You will have an opportunity to decorate your bag while onsite at TBS. Pre-order your bags for $3 each, or purchase one for $4 the day of the event.